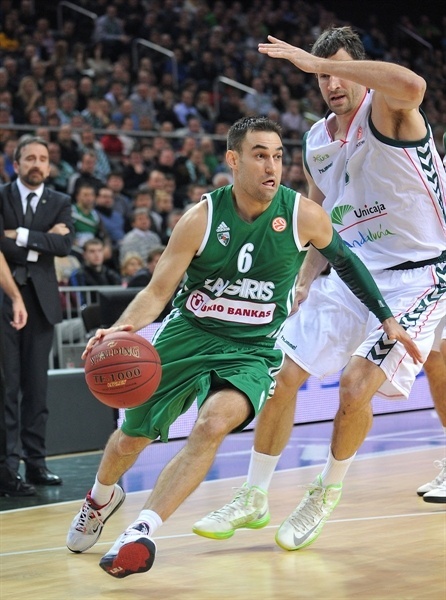 Zalgiris Kaunas picked up its first win of the Top 16 by downing visiting Unicaja Malaga 75-63 on Friday night. Both teams hold 1-1 record after two games played and share third place in Group E along with Panathinaikos Athens and Anodolu Efes Istanbul. 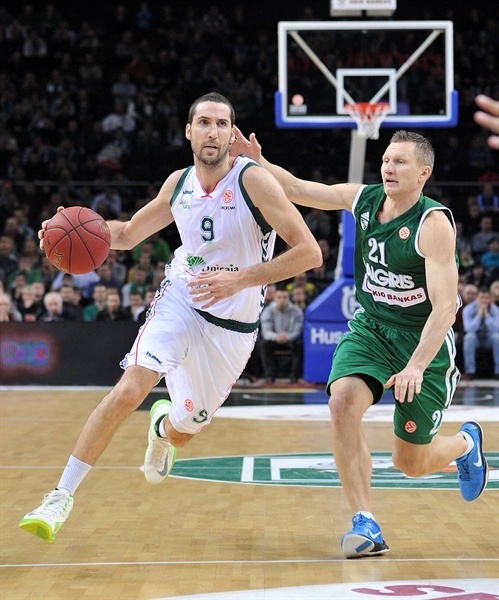 Zalgiris led for most of the game, but could not build a significant lead as Unicaja lingered for the entire night. However, Ksistof Lavrinovic and Mindaugas Kuzminskas combined for a 9-2 run to start the fourth quarter, putting the hosts in control before Paulius Jankunas made a basket-plus-foul to seal the deal with less than 60 seconds to go. Kuzminskas led the way with game-high 14 points plus 6 rebounds. Ksistof Lavrinovic finished with 12, Jankunas scored 11 while Marko Popovic chipped in with 10 points in victory. For Unicaja, Early Calloway scored all 11 of his points in the first half, while Luka Zoric also had 11 points along with 6 rebounds. 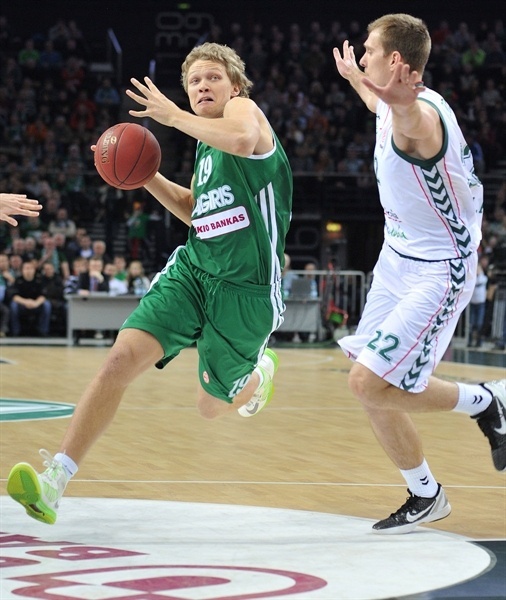 Zoran Dragic added 8 points in defeat. Jankunas hit a pair of free throws before Calloway and Ksistof Lavrinovic traded triples to start the game. Rimantas Kaukenas added a three-pointer of his own to give Zalgiris an 8-3 advantage, but Zoric made an uncontested layup and Calloway sank another triple to tie the game. Tremmell Darden scored inside as the teams picked up the pace in the opening minutes, and Darden hit a triple from the left corner for a 15-8 lead. The visitors answered with an easy layup and a shot from downtown from Zoran Dragic that got them back within a single possession. 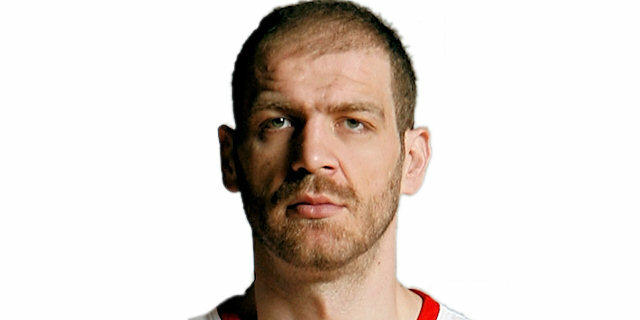 A floater by Mindaugas Kuzminskas kept Zalgiris in front before Kosta Perovic and Darjus Lavrinovic traded baskets, 21-17, and rounded out the scoring in the first 10 minutes. 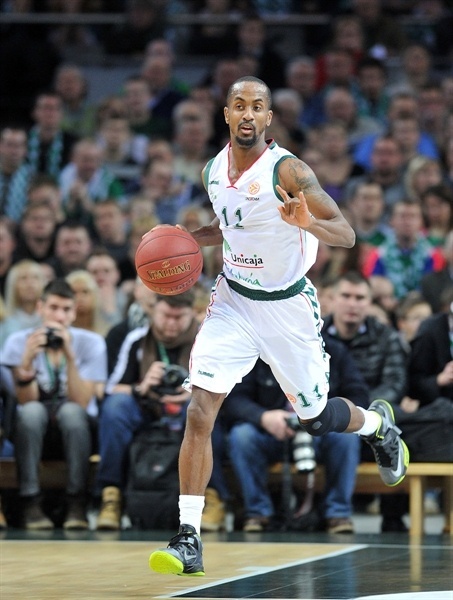 It did not take long in the second quarter for Zalgiris to double the margin. Kuzminskas and Oliver Lafayette were perfect from the foul line, and Popovic made a three-pointer on a fast break for 28-19. However Calloway hit his third three-pointer, then stole the ball and raced for an easy dunk capping a 0-7 run for 28-26. Unicaja did not allow a field goal the rest of the quarter by combining smart defensive plays from Calloway and Marcus Williams as well as profiting from some sloppy Zalgiris passing. The visitors tied the game through Krunoslav Simon, 30-30, but in the final four minutes of the quarter failed to produce a field goal themselves. On the other side, a steal from Popovic in the final second of the quarter led to a pair of free throws by the same player, giving Zalgiris a 34-30 halftime lead. Fran Vazquez opened the third quarter with a long jumper, but Lafayette and Popovic hit back-to-back three-pointers for 40-32. Unicaja replied with a 1-10 run, started with a dunk by Zoric and a triple from Sergi Vidal, before Vazquez hit another long jump shot and finally Simon sank a three-pointer, 41-42. 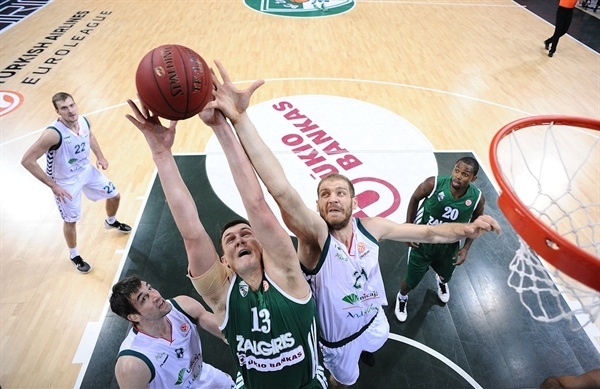 Darjus Lavrinovic scored inside, quickly restoring Zalgiris’s lead before Dragic’s basket-plus-foul tied it at 45-45. The hosts remained in front by going 5 for 6 from the foul line, and Kuzminskas scored inside for a 5-point lead, but Vazquez made a tip-in in the dying seconds of the quarter for a 52-51 edge going into the final 10 minutes. Ksistof Lavrinovic opened the fourth quarter with a three and Kuzminskas’s put-back restored a 6-point Zalgiris lead before teams went into a two-minute offensive slump despite racing from one end of the floor to another. Txemi Urtasun made a runner to end the scoring drought, but again Kuzminskas and Lavrinovic extended the lead to 61-53. A dunk by Zoric after a lovely pass from Calloway gave Unicaja hope, but couple of layups from Lafayette extended the lead into double figures, 67-56. Williams hit a three-pointer on the other side, helping Unicaja cut it to 67-61, however, Jankunas made basket-plus-foul to seal the deal. Jankunas then and added a triple and a blocked shot in the final seconds before Kaukenas hit a buzzer-beating jump shot to account for the final score. 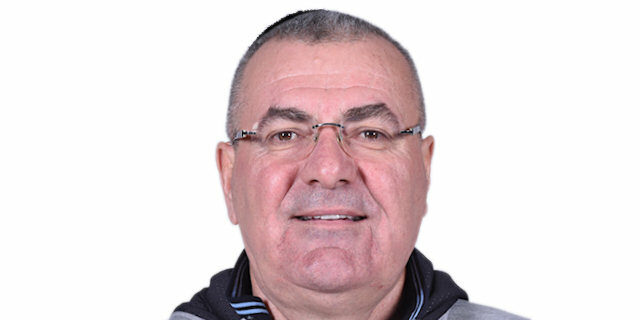 "After the game I told the players that it wasn’t our best game. We were quite nervous in some episodes, but we were playing with the right attitude. Also after such a good start to the season the pressure is getting bigger. The difference was that we had five players who scored 10 points or more and Unicaja – only two. Both teams were good in defense, had quite equal stats except for rebounding, which we won by 8. That was a team effort. But this time I also want to point out our captain Paulius Jankunas. Maybe he didn’t score 20 points or grab 15 rebounds, but he was everywhere in every important moment and he was the man who I can thank the most tonight." 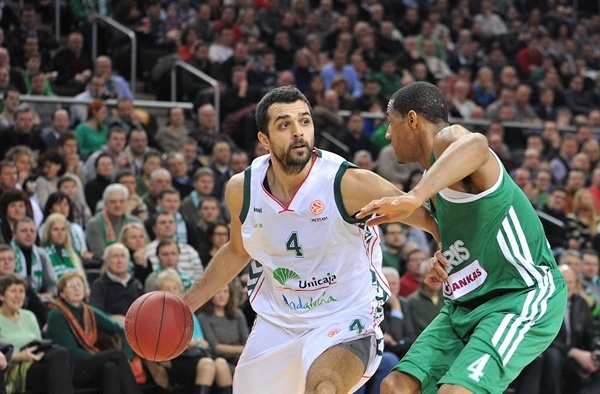 "Congratulations to Zalgiris for the win, which they deserved in the end. Only the final margin wasn’t fair. While we were in control of defensive rebounds and played patiently, we were in the game. But in the fourth quarter we made a few turnovers, which led to their easy fast breaks and we didn’t organize defensive rebounding well. Overall defense, especially in the half court game, was good, but we collapsed in the last quarter. 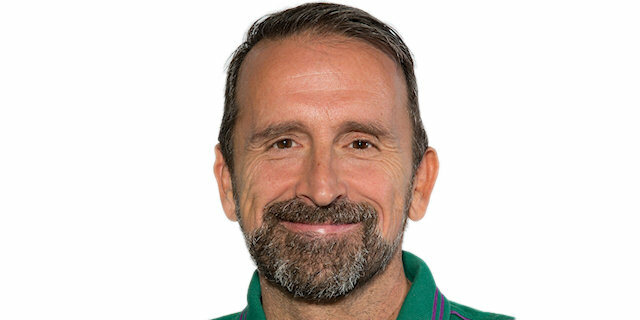 But we cannot forget that we are younger team than this experienced Zalgiris team. 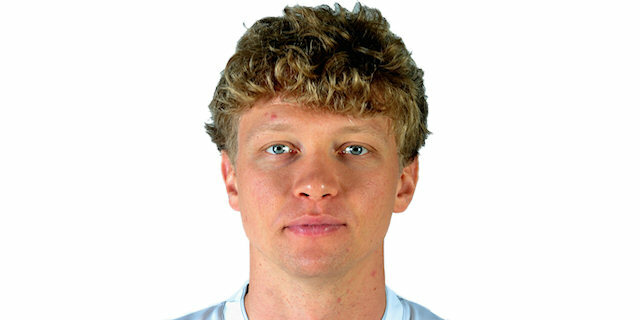 I wasn’t surprised by the play of Mindaugas Kuzminskas. I know this player and we talked about how to play him before the game, but his defenders weren’t concentrated enough." "Every game is very important right now. It’s the Top 16. In the beginning both teams were struggling a bit. We felt some pressure, because we lost the first game, so we weren’t feeling comfortable. But later we got into our game and we won it in the end. It’s an incredible feeling to play in such an atmosphere. Our fans are our sixth player." "We had our last game at home, so this time it was very hard to play because of the 15,000 people. We prepared for the game and we were fighting until the last two minutes. Then we lost our concentration, made two or three mistakes and that was enough to lose this game. In the end we couldn’t play at the same level that Zalgiris played. 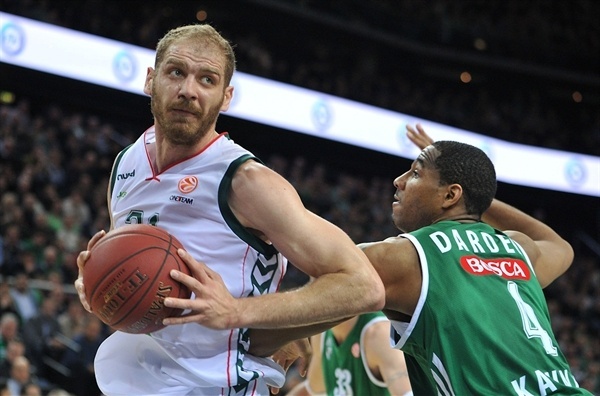 Zalgiris has good players, they played very aggressive and they were at home. 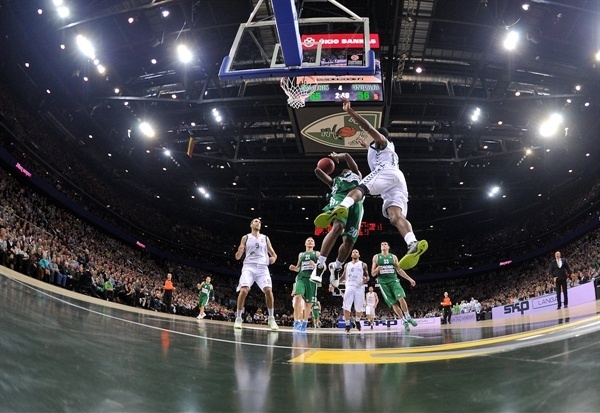 Zalgiris has the best fans in Europe, so it is also very nice to play here. So the power of the fans, aggressive game and good players let them win. This time I think I didn’t play 100%, so I can’t be proud of myself, because me and my team also made a lot of mistakes. "